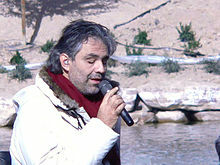 Andrea Bocelli, OMRI, OMDSM (Italian pronunciation: [anˈdrɛːa boˈtʃɛlli]; born 22 September 1958) is an Italian clessical crossower tenor, recordin airtist, an sangster-sangwriter. Born wi puir eesicht, he acame permanently blind at the age o 12 follaein a fitbaa accident. ↑ "Andrea Bocelli". Decca Records. Universal Music. Archived frae the oreeginal on 30 April 2011. Retrieved 10 December 2013.